Steve Irwin, 44, the hyper-enthusiastic, thrill-seeking Australian wildlife conservationist who gained a worldwide following with his television show "The Crocodile Hunter," died Monday after a stingray attack while filming along the Great Barrier Reef. Irwin was swimming in shallow water off the northeastern Australian coastline, 60 miles north of Cairns, when the ray's barbed tip punctured his heart. On location for a new documentary series called "Ocean's Deadliest," he had taken the day off because of uncooperative weather and instead was diving for his 8-year-old daughter's new television series. He was following a fleet of stingrays when one turned on him and fatally struck, an extraordinarily rare action. In the past decade, 17 deaths worldwide were the direct result of stingray barb injuries, according to Surf Life Saving Australia, a beach-safety resource organization. The poisonous spine at the top of the ray's whiplike tail can tense and strike if the sea creature feels threatened, but the jab from the 10-inch barb seldom proves fatal. Footage of the incident, which police seized, shows the animal turning and hitting Irwin, who immediately collapses in the water, according to The Australian newspaper. Irwin was taken by his boat, Croc One, to a rescue helicopter that flew to a nearby island. Despite attempts at resuscitation, he was pronounced dead before reaching a hospital. Irwin was known for getting melodramatically near the claws and jaws of land and sea creatures. This was the allure of his television franchise, mostly seen by American audiences on the Animal Planet cable channel for the past decade. "While most shows use long lenses, we get right up close so the audience feels like they're smack in the middle of the bush," Irwin told Entertainment Weekly magazine. "One time, a 10-foot saltwater croc grabbed me on the hand and -- whap! -- pulled me into the water. Luckily, I swung around and landed on his head, which gave him a bit of a shock and gave me just enough time to get away." In the tradition of Marlin Perkins, Jacques Cousteau and, more recently, Bill Nye, Irwin was credited with popularizing wildlife science. He staked out animals in their habitats while lecturing to viewers in a whisper and keeping ever alert to a sighting. He was typically garbed in khaki shorts and short-sleeve shirts, giving him the appearance of an African explorer, and his shaggy blond hair, parted in the middle, gave him a friendly, boyish air. His signature was an explosion of exclamations in his thick Australian drawl, typically "Crikey!" when in awe, "Gorgeous!" when showing off some reptile's charms or "Danger! Danger! Danger!" when even he knew it was wiser to keep a distance from an aroused animal. He boasted of hand-feeding the world's most venomous snakes without being bitten. However, a 13-year-old female saltwater crocodile once took a large bite from part of his leg, a snack Irwin defended from the animal's perspective: "The poor little female was just defending herself." He carved such a distinctive personality that he launched a mini business empire of toys and games based on his programs. He starred in a feature film in 2002 -- "The Crocodile Hunter: Collision Course," in which the CIA goes looking for a fallen satellite that has been swallowed by a crocodile -- and was a pitchman for Pentax cameras and FedEx. Irwin was also much parodied, memorably on the "South Park" comedy show, and his catchphrases were used in college drinking games. He lampooned himself on the NBC show "Late Night with Conan O'Brien" by wrestling an inflatable crocodile in a kiddie pool. He was a national icon in Australia, where Prime Minister John Howard invited Irwin to a prawns-and-Chablis barbeque welcoming President George W. Bush in 2003. At times, Irwin's derring-do led to negative press, most famously in 2004 when he cradled his infant son while feeding a dead chicken to crocodiles inside a zoo pen. He claimed that the child was never in danger, and Irwin was never charged with any crime. 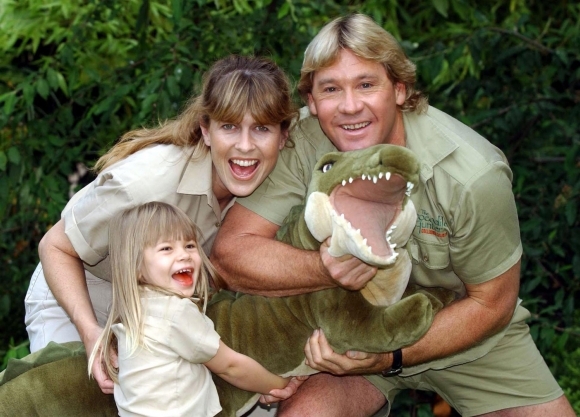 When not filming his specials, Irwin and his American-born wife oversaw the Australia Zoo, a popular wildlife park started by his parents. "Our whole passion to be on this planet is to educate people about wildlife," he said in 1998. "I will die doing that. I have a gift." Stephen Robert Irwin was born Feb. 22, 1962, in Essendon, Victoria, near Melbourne. His father worked as a plumber and his mother was a maternity nurse, but they were both amateur naturalists, and in 1970 they moved the family to the Queensland community of Beerwah on the Sunshine Coast. They bought four acres to start their zoo, which opened to the public in 1973 as the Queensland Reptile and Fauna Park. Irwin spent much of his youth helping his parents nurse injured birds and raise kangaroos. At 6, he was overjoyed when his parents bought him his very own 11-foot-long scrub python as a birthday gift. One of his defining early childhood experiences was "jumping" a crocodile in the Australian outback, with his father's permission. The father-son team caught with their bare hands or bred nearly all the 150 crocodiles at their park. After high school, Irwin joined the government's Crocodile Management Program, a plan to relocate the aquatic reptile when they came into conflict with people, and he distinguished himself nationally in the art of crocodile capture. His work also took him to Australian rain forests, and he became accomplished in studying goannas, a type of lizard. "Living like a possum, I'd occasionally come down out of the trees for a feed," he wrote in a memoir. "Fortunately God blessed me with orangutan arms. To study arboreal animals, you've got to become one: I could climb anything." In the early 1990s, he took over his parents' park and headed a cougar conservation effort. He also filmed a 10-hour television documentary about his work called "The Crocodile Hunter." But the producer, John Stainton, was so mesmerized by Irwin's own amateur videotapes that Stainton persuaded an Australian network to devote an entire series to Irwin. The show proved popular in limited syndication, and Animal Planet began airing the program in 1996. It became the channel's most popular offering, won a Daytime Emmy Award for best children's series and led to such spinoffs as "Croc Files." Robert J. Thompson, the founding director of the Center for the Study of Popular Television at Syracuse University, said Irwin was the "consummate cable star" who "liberated the nature documentary from bounds of educational documentary" with his vaudeville-like comic touches. Irwin did for Animal Planet what "South Park" did for Comedy Central and "Queer Eye for the Straight Guy" did for Bravo, Thompson said. "Entire cable channels are made by one or two big hits," he said. "It's a very different cultural model than for the broadcast era." In 1992, Irwin married an Oregon-born naturalist, Terri Raines, who became his filming and writing partner. She and their two young children, Bindi Sue and Robert, survive him. Irwin's insistence on face-to-face meetings with his subjects sometimes brought him trouble from authorities. While filming in Antarctica in 2004 for a documentary, he was criticized by animal-rights groups for allegedly violating an Australian prohibition against human interaction with the wildlife. "Totally beat up, mate," he told an interviewer. "Like I'm tobogganing over there, the penguin's over there -- what's the big deal? Don't know what they're on about there. Don't understand that one at all." Nothing came of the controversy, but Irwin had long spoken out about the need for such proximity to animals. "The day has come where we can't keep looking at wildlife on a long lens on a tripod, which, historically, nature documentaries have done," Irwin said. "Then there's this voice of God telling you about the cheetah kill. After 450,000 cheetah kills, it's not entertaining any more."